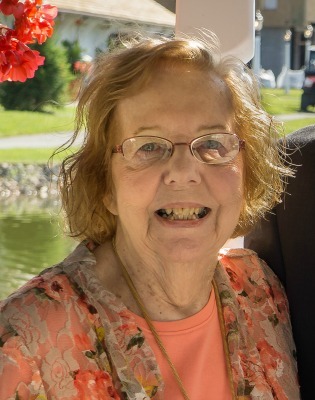 Helen A. Barnett, of Lancaster, passed away on April 6, 2018. Born in Clearfield, PA, she was the daughter of the late Theodore and Garnett (Goss) Shields. After graduating from Lancaster Bible College, Helen spent a large part of her professional career as an administrative assistant for State Farm Insurance Agency. In her spare time, she enjoyed scrapbooking, crafting and playing Racko with her grandchildren. She was also a member of the “Sassy Lassies” of Lancaster, PA.
She is survived by her children, Candace Anderson and Eric Anderson (husband of Tanya) and her grandchildren, Matthew, Jeffrey and Kristen. She was predeceased by a brother, James Shields. Relatives and friends are invited to attend her Celebration of Life Service at Grace Baptist Church, 1899 Marietta Ave, Lancaster, PA 17603 on Tuesday, April 17, 2018 at 11:00 AM with the Rev. Dr. Harold Keim officiating. A visitation will be held from 10:00 AM until the time of the service. Keeping with Helen’s wishes, the family requests that those attending the service wear bright colored and cheerful clothing as well as “funny socks.” In lieu of flowers, contributions may be made to Lancaster Bible College, Attn: Advancement Department, 901 Eden Rd, Lancaster, PA 17601. As her new neighbors (1146 Kenneth Dr), Paula and I knew Helen only a few months but appreciated her and her love of our Lord. It was my pleasure to help repair some of the post-storm damages around the house. So sorry to hear of Helen’s passing. May you know God is with you as you make the adjustments in the days ahead. As a neighbor, we will miss seeing her pass our house on her way to where ever! My thoughts and prayers are with you and your family. Helen was a wonderful lady and will be truly missed. She always made me laugh and will hold a special place in my heart. I was so sorry to hear about Helen’s home going. I will miss her terribly. She loved the Lord. She loved her family. She loved to make people feel special. We had a lot of fun and adventures together. She was a dear friend. I am praying for the comfort of her family and friends. Eric and Candice, you lost a treasure when you lost your Mom. She was unique, one of a kind and a wonderful person. But, of course, you always knew that. When I became a State Farm agent in 1989, she not only mentored me, but more importantly, she befriended me, and we remained friends till her passing. I will miss her. Keep her memory close to your hearts, think of her often and smile. I have lost a great friend, whom I did not know was ill. Went to Florida and we had planned to have lunch when I returned, instead Helen is eating at the banquet table in Heaven. I will miss her forever. She loved her family, and Jesus very much. And yes, she loved me as a friend. See you again dear Helen.